As I was leaving the co-op where I volunteer today, I noticed in the specialty components display, a set of Suntour 7 speed indexing bar end shifters. Does anyone know what brands components these will work with? They are in great shape and I would like to use them on a project, if I can do it with readily available parts. I have a 1977 Eisentraut Limited in the works that has clamp on Huret DT friction shifters. Sadly, as I age, my coordination has deteriorated to the point that I don't feel comfortable with DT shifters. For my vintage bikes, I use barcons for drop bars and thumbies for upright bars. Modern road bikes have brifters. The left Suntour shifter is ratcheting, but I only saw the index setting and didn't check for a friction or ratcheting setting. So, if these would work with Shimano drive train components, I'll snag them. Any inputs would be greatly appreciated. Pics would help, but understood it's hard when they are in a display case. Unless you have a matching Suntour rear derailleur, this likely won't work in indexing mode with anything else - Shimano and Suntour used different pull ratios (don't know what they are, just quoting Saint Sheldon). If you can switch to friction mode, they will work with just about anything. SunTour's indexed shifting was never as good as Shimano. Your barcons should be fine in friction mode on your 'Traut. I have a 1977 Eisentraut Limited in the works that has clamp on Huret DT friction shifters. I'm no expert, but I don't recall Suntour making any lever shifters (DT or Barcon) without a friction mode. 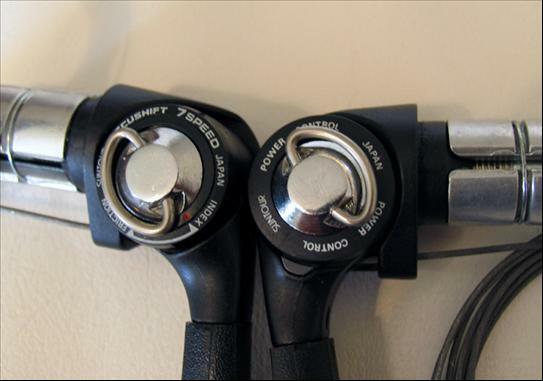 I would grab them along with a DT clamp on cable stop. Next dumb question, does anyone know which Suntour RD is compatible? I'm no expert, but I don't recall Suntour making any lever shifters (DT or Barcon) without a friction mode. Loads of Accushift shifters lack true friction modes. Many of them instead have "soft index" modes that combine the indexing with a friction plate. So each click puts the shifter to within the *vicinity* of a given cog, but you still trim the shift. 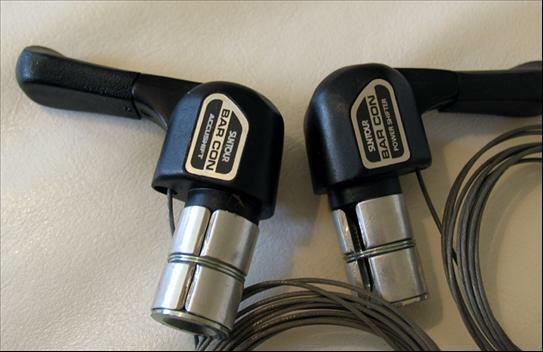 That "index/friction" switch thing was a Shimano innovation that they enforced after the first year or so of Accushift. The "light indexing" I'm familiar with (6 & 7 speed Command Shifters and 8 speed SL and Superbe Pro) is just indexing with a lighter click- but I don't notice any room to trim. Last edited by The Golden Boy; 10-25-18 at 04:15 PM. Reason: Added the 7/8 speed pic. Accushift stuff is only compatible with Accushift stuff- in other words, you need an Accushift RD to work with Accushift shifters. (exactly like how you need a 7400 series Dura Ace derailleur to work with 6-8 speed Dura Ace shifters). Accushift 6 speed is easy because the spacing is the same between cogs as 5 and 6 speed freewheels- So you can use Accushift shifter with Accushift RD with a Shimano SIS compatible 6 speed freewheel. (you can also use a 5 speed freewheel). Where it gets goofy is with 7 and 8 speed- the spacing between cogs is different between the larger cogs and the smaller cogs- whereas SIS used even spacing between all the cogs. You'll often hear people complain about Accushift performance- it has to be adjusted just right with parts it was designed to work with. SIS is designed with slop in the system to make it work. Accushift depends on everything being right on. I've read of different cable routing and kludges to use an SIS derailleur with Accushift shifters or some other thing... don't expect it to work- and then complain about how poorly it performs. If you don't have an Accushift 7 speed cassette or freewheel- and Accushift rear derailleur, I would pass on the 7 speed Accushift shifters. I currently have 2 bikes in use with 6 speed Accushift shifters and derailleurs with 6 speed Shimano freewheels. Last edited by The Golden Boy; 10-25-18 at 12:41 AM. I'll check the price during my next shift and if it's OK, I may get them just to play with. Here's my experience with Accushift. I'm running 6 speed barcons with an older Shimano Deore RD on a Suntour Winner Pro freewheel with excellent indexed shifting results. The spacing on that FW is narrower than standard 6 speeds so I had to switch to a narrow 9 speed chain to get it to work. I have a 7 speed set that I'm using with a Suntour XCD 6000 RD and 7 speed Shimano HG cassette. That is my main touring bike and has flawless index shifting. I agree with 7 speed levers you pretty much need to use a Suntour Accushift RD but at least I'm having good results with a Shimano cassette. I prefer Accushift for 6 and 7 speed applications and there are plenty of good indexing Suntour RD's around so if the price is right I'd grab the levers. I find that the 13-30t Accu-7 Alpha freewheels are relatively plentiful out there at the co-ops and on period hybrid/mtb bikes sourced at yard sales and such. And there are many Accushift derailers to be found, just that the (cheaper) 3xxx-series (such as 3040) models do not index with 7s shifters or with the better 6s shifters. And I always use Shimano 9s chain with any Accu-7 setup (which compensates for the shifter's generous over-shift dimension when shifting toward larger cogs). 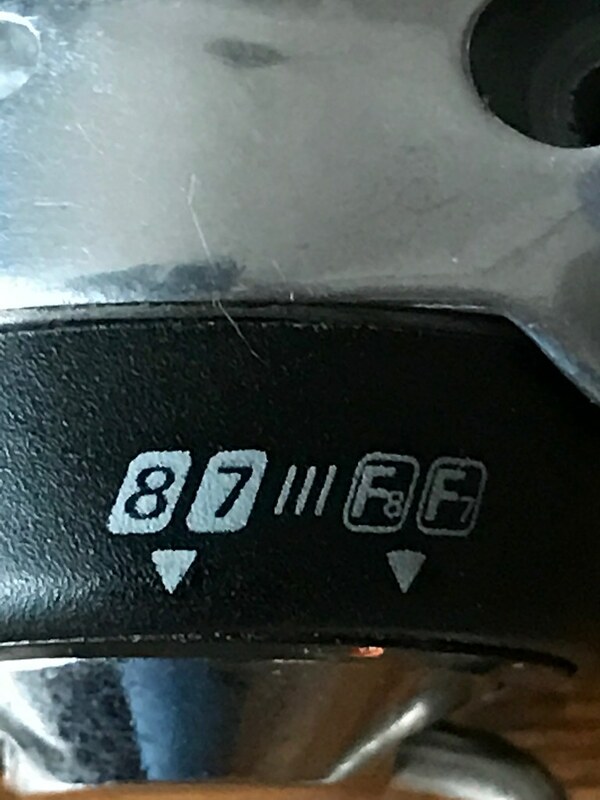 I used to use Shimano 7s HG cassettes with Accu-7, but which did absolutely require that I re-space the cogs to give consistent shifting across the range. As far as compatibility, more than everything you want to know is in this tech bulletin. I have to say, those old Suntour documents were probably a big part of why Suntour is no longer with us. Just as with an ineffective political campaign, Suntour forgot the part about K.I.S.S., or "keep it simple, stupid". Bike shops by the late 80's just wouldn't usually have the luxury of time to memorize ever-changing, over-complicated components documents, and weren't always into keeping an expert on staff who could keep the info fresh in their minds, and who also could properly build up asymmetric Suntour freewheels with all of their crazy shims and spacers. The 7s bar-end shifters will work with any Accushift derailer other than the 3040 models, and work well with pre-1997 (pre-9s) Dura-Ace derailers using Suntour Accu-7 Alpha freewheels as large as 26t. Last edited by dddd; 10-29-18 at 10:35 PM. Reason: 9s was 8s, Accu-7 Alpha freewheels specified. That's all. You're definitely spot-on that absolutely nothing about Suntour indexing was KISS, and Shimano's quicker setup and near-zero need for after-service was a giant nail in Suntour's coffin. But it wasn't that Suntour forgot about KISS, it was that they lacked the resources to design it KISS without violating Shimano's patents. If you can't float the pulley, you have to put at least a little play in the lever, and EVERYTHING else down the line has to be to spec. There was no time/money/manpower to do it right that first year, and as Suntour lost tons of spec every year thereafter, and dealt with the Shimano patent violation lawsuits, even less $$$/yen was available to improve the product. By the time better chains, cog tooth profiles and shifting mechs were available, and bike mfrs realized they couldn't sub cheaper drivetrain spec, there weren't enough mfrs spec'ing the stuff to keep them in business. Add to that the Winner/Winner Pro spacing/spacer problems, and not producing cassette hubs quick enough. And it didn't help that they had 3 distinctly different derailleur geometries that really required three different shift lever mechs, but they could only afford to design/manufacture one. Pretending one lever could shift the entire line did not make it true. The 7s bar-end shifters will work with any Accushift derailer other than the 3040 models, and work well with pre-1997 (pre-8s) Dura-Ace derailers using freewheels as large as 26t. It seems amazing to me that Campagnolo "weathered the storm" and stayed afloat despite all of the patents. It seems that there has to be "a story" about how they do it and did it. My experience: Accushift XC Comp thumbies and rear derailleur (guide pulley a la Centeron mode), plus 8 speed Shimano cassete and 9 speed chain. Those are 8s shift levers? They will actuate the same derailers as Accu-7 levers, but Suntour's 8s indexing is much more evenly spaced that Accu-7 so is much like Shimano I believe. The 9s chain precludes the need for a floating pulley in my experience with Accushift, and can be a solution to slight indexing mis-match between freewheel, shift lever and rear derailer. Shimano and Suntour use the same spacing on their 7 speed freewheels. Shimano has more ramps and twisted teeth so I prefer them. Most RD from Suntour will work fine. I use a Cyclone made for a friction 6 speed and it's perfect. Almost any Suntour RD will work fine even if not made for indexing. Shimano freewheels work better but Suntour should work well enough with the Suntour bar ends. Old thread, but did you mean that any old Suntour derailer would index properly and work with Accu-7 shifters? Shimano 6s freewheels are a perfect replacement in any Accu-6 application, but the Suntour Accu-7 systems use significantly different (asymmetric) freewheel cog spacing than Shimano ever did. And as I had mentioned last year, a narrower 9s chain will make any indexing/spacing mis-match seem less noticeable. 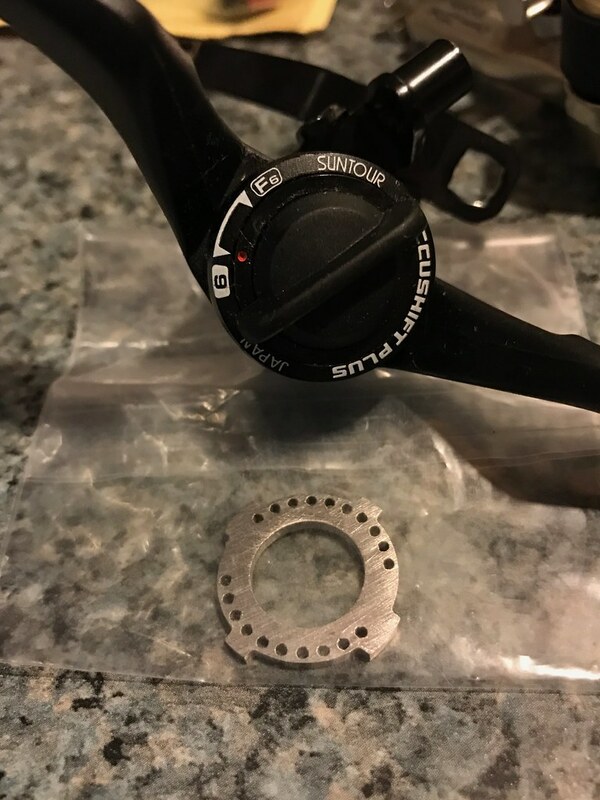 I have Campy Synchro-II 7s shifters and derailers that work well with a modern 13-25t Sunrace freewheel (in place of the designated 7s Regina freewheel), but only after I changed to narrower Shimano 9s chain. Yup the Suntour friction derailleur worked just fine on the Shimano freewheel. The 7 speed freewheels are identical (.5 spacing) so the Suntour accushift levers worked perfectly with a minimum of changes. Pretty much all the changes needed were the levers and a 7 speed freewheel. I like the Shimano freewheels. They seem to work better. The 6 speed friction became a 7 speed indexed. Columbus Schwinn Tempo vs. 531 Trek 400 Elance?